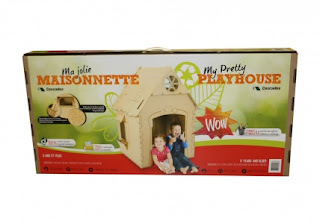 My Pretty Playhouse is an eco friendly, 100% recycled cardboard dream house for little people! 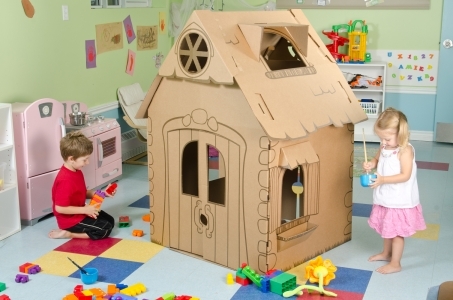 Let your little artist go to town designing their perfect playhouse. Use markers, paint or even crayons to color and design with a full imagination! Super easy to assemble, this playhouse will offer hours of entertainment for your little one, all the while sustaining the earth with the reuse of paper products. Cascades is the largest recoverer of waste paper in Canada! They are doing their part in being eco conscious and creating fun products not only for children, but great resources for the entire family. 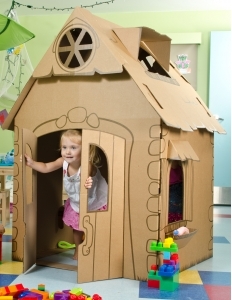 But that’s not it, My Pretty Playhouse will also help build real homes! Cascades will donate two dollars to Habitat for Humanity for each playhouse sold. Cascades has a rich history of community involvement, so it was only natural to partner with this great charity, offering direct assistance to families in need. 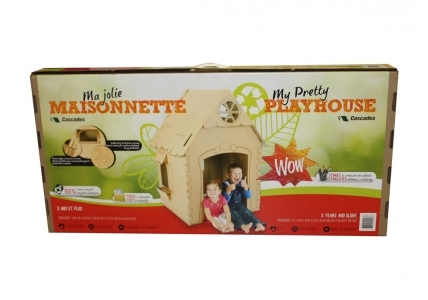 Enter to win a Pretty Playhouse!! This would be for my four year old daughter. for our local salvation army who has a toy drive each year to give needy kids and families a christmas! I would like to win it for my son! I would either give it to my daughter or donate it. Thank you for the giveaway! Triplet nieces; hopefully they'll fit!